In December of 2013, General Shelton spoke before the AFCEA NOVA Chapter on Air Force IT Day. 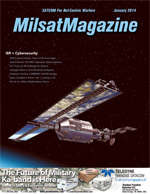 Our thanks to AFSPC/PA Operations and Captain Chris Sukach and Anthony Roarke for forwarding to MilsatMagazine the transcription of his presentation. Space is fundamental to the economy, the military and the way of life in the United States and officials must continue to guard against challenges in the domain from adversaries, the commander of Air Force Space Command said on January 8th, 2014, to students at George Washington University in Washington DC. Anthony J. Navarra, President of Space Operations and Special Projects at Globalstar, has been working with Globalstar for nearly 22 years. For more than a decade now, the demands of two wars, regional unrest and natural disasters around the world have driven the Intelligence Community (IC) to develop better information pieces to apply to the intelligence puzzle: More useful signals information, satellite imagery, Unmanned Aerial Systems, aerial and satellite full-motion video, multi-camera generation, three-dimensional images, human intelligence and on it goes. Intelligence, Surveillance and Reconnaissance (ISR) is by far the most prevalent application for Unmanned Aerial Systems (UASs). In June, NASA’s Space Technology Mission Directorate announced that the Jet Propulsion Laboratory (JPL) would fly the Deep Space Atomic Clock payload aboard the commercial Orbital Test Bed satellite that is being developed by Surrey Satellite Technology US (SST-US) at the firm’s new Colorado assembly facility.